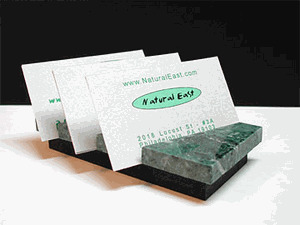 Green Marble Business Card Holder (rectangular): Multiply the impact of your Business in Sophisticated Green Marble! This simple marble desk accessory doesn't just hold your business cards, it amplifies them! A simple business card becomes a bold statement on your desk. This rectangular 3 slot design is cut from natural stone. The rich green marble beautifully accents your workspace with a classic material. Up to 45 business cards can be displayed.